Venice High School Rebuild and Fort Myers Fire Station No. 1 both earned Top Eagle Awards from the Associated Builders & Contractors Gulf Coast Chapter. 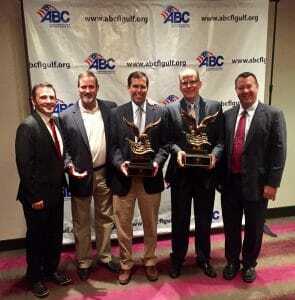 Tampa, FL – May 9, 2017 – Gilbane Building Company announced that two of its projects in the West Coast of Florida earned top Eagle Awards in the 2016 Excellence in Construction (EIC) ABC Gulf Coast Chapter. The winning projects showcase a multiphase K-12 facility and a new community fire station. Gilbane was construction manager on both the Venice High School Rebuild and Fort Myers Fire Station No. 1 projects. Representatives from the company received the awards at Annual Excellence in Construction Awards Gala event held in Sarasota, Florida. The Venice High School Rebuild project included new construction as well as renovations to an existing occupied and active 1950’s era campus. Construction took place in three major phases with 22 intermediate phases. The scope for the high school project consisted of 12 buildings including site work, renovations, additions, landscaping and hardscaping. Challenges included intense coordination of trades to keep existing underground utility lines free from damage and maintain campus operations during construction. The new Fire Station, Administration and Headquarters facility, built for the City of Fort Myers Fire Department is in a central location within the downtown core and surrounding areas within a half mile service radius that ensures the station’s rapid response time. This building houses a fire station, operations area, crew quarters, fleet fueling, meeting and training rooms, and centralizes Fire Administration and Fire Prevention departments. Gilbane has a strong commitment and specific business strategies to provide ample opportunities to the local subcontractors and trades based on merit. The Excellence in Construction Awards is the industry’s premier competition that recognizes innovative and exemplary merit shop construction projects, world-class safety and diversity programs.